"Reading without reflecting is like eating without digesting." - Edmund Burke. 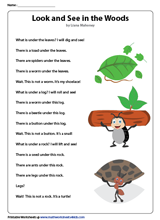 Cultivate the habit of insightful reading with this compilation of ELA reading comprehension worksheets for grades 1 through 5 featuring stories, passages, poems and adequate activities. In the elementary stages, themes, characters, vocabulary and settings of what kids read, appeals to them; which is precisely what is expected by the Common Core State Standards. Test comprehension using a variety of skill sets as kids ascend the ladder of grades step-by-step. The objective of the first-grade reading comprehension passages, stories and poems is to help kids comprehend and retell stories, figure out the main characters and answer questions about the events. Inculcate a love for reading, hone vocabulary and a few aspects of grammar as well. Practice recounting stories, understand the overall structure, figure out the moral and answer the who, what, where, when of the text with this collection of fiction, non-fiction and poem reading comprehension worksheets hand-picked for kids of 2nd grade and aligned to Common Core State Standards. 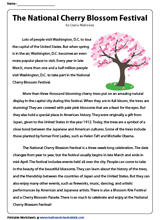 Referring to chapters, scenes or stanzas to form their answers, kids gain an insight into how and why an event occurs, and discern literal and figurative meanings and analyze characters using this unit of grade 3 reading comprehension worksheets involving interesting stories, poems and informational passages. 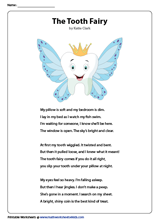 Character sketches get profound in this batch of 4th-grade reading comprehension worksheets, as kids are intrigued by the thoughts and actions of characters in the stories and poems. Kids look for comparisons to the textual theme or dive deep into the passage for any domain-specific words and respond to the variety of questions. 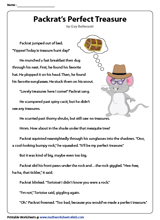 Incorporate this finest blend of reading comprehension passages, poems and short stories, tailor-made for children of grade 5 to introduce a few literary devices, and help make inferences based on comprehension. Enhance vocabulary and improve fluency in the process.